UNTIL two years ago, 22-year-old Sam Westrop had virtually no contact with the Jewish community. Now he heads a powerful West End of London-based organisation which counteracts Muslim extremism and anti-Israel propaganda, especially on campus. 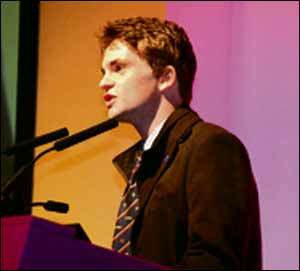 A combination of what Sam calls "luck, hard work and meeting the right people" led him to establish the Institute for Middle Eastern Democracy, whose offices near the Strand have exposed anti-Israel A-level geography textbooks and Arab funding of British universities and prevented extremists from speaking on campus. Sam, whose father is not Jewish but whose maternal grandmother lived and worked in Israel for its government, describes himself as "still not a member of the Jewish community". He said: "I am not communal. I had nothing to do with anything Jewish till the age of 20. "My father is not Jewish. My mother is. My family is not religiously or communally involved and the same with me." Sam spent his gap year as an 18-year-old on Kibbutz Yiftah, near Kiryat Shmona. But he insists that he went to Israel "very much from a non-Jewish perspective, although technically I was Jewish". He said: "I was fascinated with Israel. I thought it had an extraordinary story. I wanted to learn more. "I followed things very closely and had always been fairly political. My grandmother worked with the Israeli government researching the PLO. "There had always been a family interest in Israel, not from a communal or religious perspective but more from a moral perspective." Before going to Israel, Sam also visited Jordan and Syria. He said: "I did not find the Arabs romantic. I found them interestingly hostile. "A mentality of very irrational hatred was evident everywhere, venom regurgitated by government propaganda. "Decades of despotic rule have kept a perpetual mob mentality. "There is not the ability for the individual to think about what the reality of their relationship with Israel may be." Studying music at York University following his spell on kibbutz, Sam was shocked to find "almost ubiquitous anti-Israel sentiment on campus". He said: "I saw the anti-Israeli propaganda as more antisemitic. "Every day I was inundated with hateful, bigoted anti-Israel propaganda, combined with the growth of extremism on campus, which was challenging the western values of liberty and equality." Sam was especially shocked because, he said, "York is still very much a white, liberal university". He went on: "It does not have a mix of other cultures. "That made it more shocking, because there was no ideological basis for it. The Palestine Solidarity Campaign maintained a very active presence in York, enabled by mostly far-left groups and the Islamic Society, which in my first year was run by my friends. "But in the second and third years it was taken over by deeply unpleasant people, who invited antisemitic, homophobic speakers to come along. "This created an air of intolerance and a culture of extremism in university. "I certainly saw a connection between the far-left, anti-Israel and Islamist organisations all legitimising each other." Sam, who was active on the university political scene, was perceived as right-wing. He said: "I thought that was a slightly unfair label. I was more pro-Israeli and pro-western. "As soon as you don't fall in line with certain modish views like the delegitimisation of Israel or apologies for terrorism, you're suddenly right-wing." He began by running the Freedom Society, which discussed topics like immigration to the EU and the delegitimisation of Israel. Wanting to do more for Israel, he approached the Union of Jewish Students, expecting his enthusiasm to be welcomed. He said: "When I first tried to start, I spoke to the UJS, asking how I could help, expecting to be welcomed. Instead I was told to go away. "The most shocking thing about fighting anti-Jewish sentiment on campus is that groups like the UJS often refuse non-Jews. There are quite a lot of pro-Israeli Muslims." Sam is especially critical of UJS' current policy of handing out Palestinian flags, calling it "disastrous". He said: "Ultimately, it gives credence to groups like the Palestine Solidarity Campaign which claim that they have a real grievance against the evil Zionist state of Israel." He is similarly dismissive of the Jewish community's actions on behalf of Israel, saying: "On the whole I have found the Jewish leadership appalling when it comes to Israel." Dissatisfied with what was being done on campus, in 2009 Sam set up - in conjunction with other-like minded people, many of them not Jewish - the Institute for Middle Eastern Democracy. He said: "By time I finished university this summer, I had 300-400 students working across the country. It is primarily a non-Jewish group, a network across the country of about 500 - a mixture of Jews and non-Jews. We think it is everyone's fight. We have a large number of Muslims". The institute highlighted AQA's A-level geography textbook which compared the Israeli security barrier to the Berlin Wall. It also exposed through Sky News, the Independent and the Guardian, how St Andrews University was being funded by the Syrian government and Exeter University by the Muslim Brotherhood. It also recently exposed how the Three Faiths Forum was employing Nadia Marques de Carvalho, who was spouting pro-Intifada initiatives on various social media. Sam said of interfaith organisations like the Three Faiths: "They are the ideal breeding ground for anti-Israeli sentiments. "They have the ultimate do-good facade. What could be more admirable? If someone can maintain an interfaith dialogue front while throwing out anti-Israel propaganda and get away with it because of the interfaith agenda, it sanitises them from criticism. "Interfaith organisations are very well-intentioned, but they avoid talking about the real issues and real counter-extremism initiatives. Most of the time they can be hijacked by anti-Israeli forces. "One of the findings of the present government programme to prevent extremism was that a large number of violent extremist groups get taxpayers' money by pretending to be interfaith." He continued: "There are great ideological forces at play which are apologised for - and enabled by - the left. "There is an unholy alliance between the far-left and Islamist organisations. This is representative of something far more sinister, making Israel the perfect target for which they can gain sympathy and legitimacy. "The institute seeks to challenge those ideologies and educate about the actual reality of human rights." The institute has managed to prevent several extremist activists like ex-Guantanamo Bay inmate Moazzan Begg and pro-terror Hamza Tzortzis from speaking on campus. Sam says: "We keep tabs on about 160 extremist speakers. We have to allow free speech, but we will not allow the providing of a platform for endorsing homophobic or antisemitic views. "We have people inside the Palestine Solidarity Campaign. We know a lot of stuff before it's announced. We stop societies from inviting them." The Institute is currently writing a report on the red-green-brown alliance, which links the far left anti-Israeli and far-right antisemites.